We have been on the leading edge of water science for over thirty years and have been proposing that there is much more to water than meets the eye. 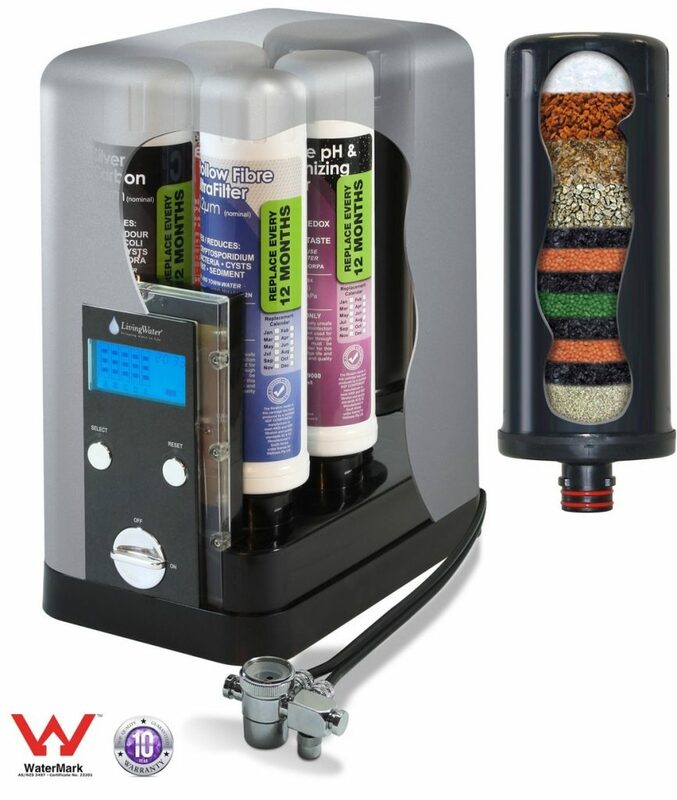 Important qualities of Wellness Filter water are superior hydration and enhanced solubility. The superior hydrating efciency and speed of Wellness water is due to the smaller, hexagonal (snowake) shape of the water molecules. 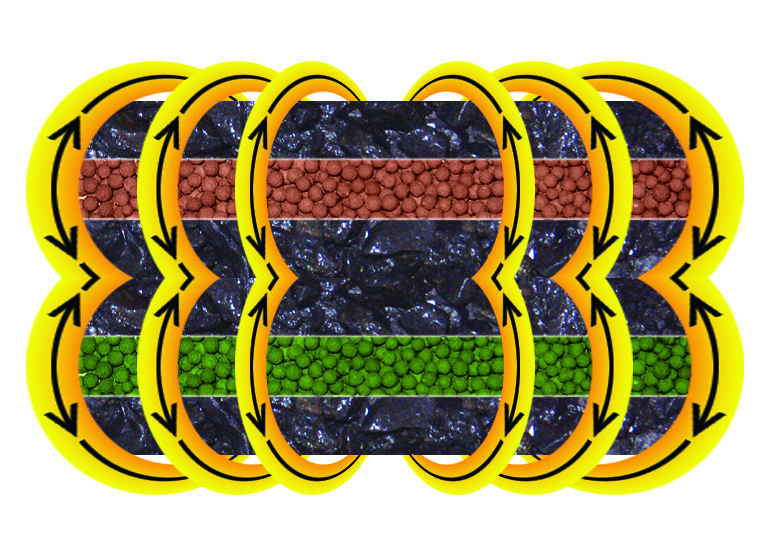 These readily pass through naturally matching hexagonal channels of cell membranes which are an optimal match to our hexagonal-shaped cell receptors. The only way to truly cleanse water, just like a computer disc, is to use a comprehensive magnetic field that wipes the information ‘clean’. Only the Resonant Activation Zone can achieve this water ‘reformatting’. The Wellness Filter uses natural, iron-rich magnetite mineral ore, surrounding an array of carefully positioned ceramic magnets resulting in naturally structured and energetically cleansed water with reduced surface tension. As water passes through this strong magnetic field, the hydrogen bonding is restructured, resulting in an enhanced hydrating and more soluble (‘wetter’) water with with very desirable qualities, including a softer, more delicate feel. 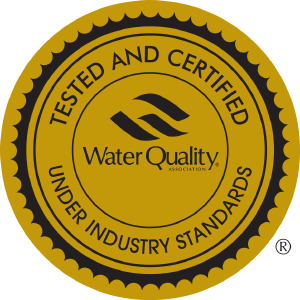 The Wellness Filter imparts yet another important quality of the world’s great spring waters — enhanced solubility. The softer, ‘wetter’ quality is due to interfacial surface tension characteristics due to the restructuring of the hydrogen bonding. Water holds a memory and it was possible the contaminants, heavy metals, pesticides and drug residues it once contained, even though physically removed, are still present energetically and may still have a negative affect on the body and cellular environment. 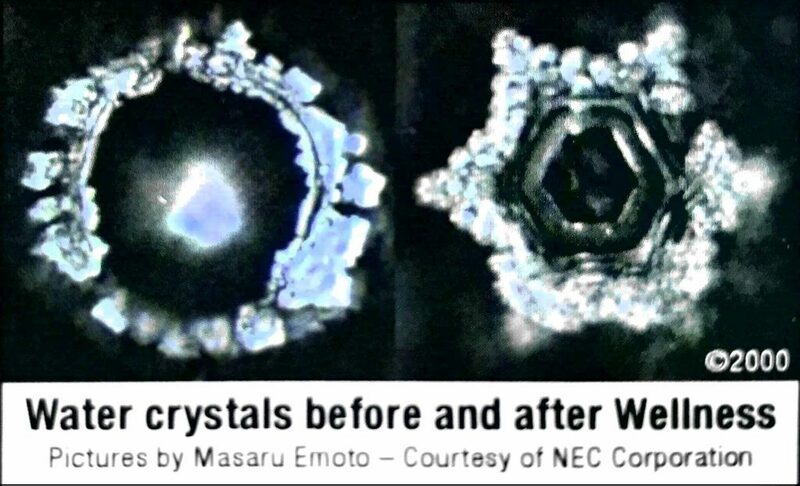 This is demonstrated in picture (above – courtesy of NEC Japan) taken by water scientist Masuro Emoto. They show what happens to water once it has been passed through the Wellness volcanic mineral energising process. Our water filter is the only one in the world to incorporate a scientifically designed energetic water cleansing process. M. Emoto, Doctor of Alternative Medicine, was introduced in the 1990’s to microclustered (ionized) water and to the technology of Magnetic Resonance Analysis. He then began a quest to uncover the mysteries of water. Renowned internationally, Emoto has published several volumes of Messages from Water, containing photographs of water crystals. His work has also been featured in the film “What the Bleep…” Experiments consist of exposing water to different words, pictures or music; then freezing and examining the aesthetics of the resulting crystals with microscopic photography.